“Dominick Dunne Does Venice” would be the rude and crude way to put it, but this is, in fact, a fascinating book. The scandals Berendt titillatingly details include the Seguso glassworks inheritance, the fate of the Palazzo Barbaroˆs piano nobile, the signing away of the Ezra Pound papers, the death and last will and testament of the poet Mario Stefani, and the feud between the president and chairman of Save Venice, all interwoven with the story of the destruction by fire of the Fenice opera house in 1996. its restoration, and the long-awaited opening night in 2003. 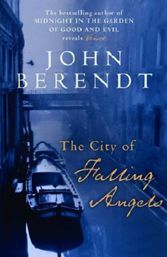 Not only are places and people vividly described, Berendt also provides ample historical background and directions to take his reader on a guided tour. Read it.